The Rebirth of Flowers, creates the notion that picked flowers are not necessarily 'dead' at the end of their vase life. For some, it is a renewal, a rebirth to the next stage of its form. Gravity alters their physical state, colours stay true or de-saturate and the textures of the petals turn brittle and crisp. Each flower has metamorphosed into a new, immortalised form. Her unusual, centre-focused photography style and processing, allows these limited-edition fine art prints to portray a rich, moody colour palette reminiscent of the Dutch masters so favoured during the 14th to 16th centuries. Maegan’s passion within greek history has now been incorporated in this small fine art collection ‘Shrine to the Greek Gods’. Flowers have had various meanings in the legends of Greek mythology with tragedy, love, loss, youth and beauty. Maegan explores the colours she chooses to represent each God/Goddess titled. Continuing her use of dried flowers, she strategically places flowers to create a body of work which could thoughtfully be represented like a shrine left for the Gods. 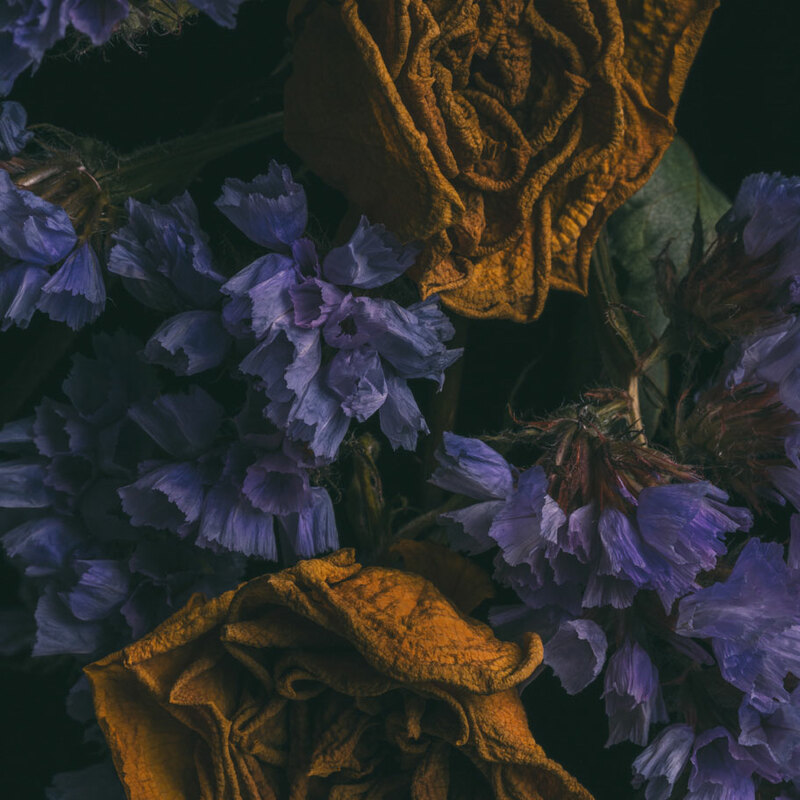 Maegan’s second photographic collection, Ice Flowers, pushes the concept of her debut series which explored the life of dried flowers. Here, she has created a body of work where flowers plunge into icy waters and delicately lock together to create temporary forms, immortally captured. Melting ice exposes welting petals, creating cracked surfaces and minute details that champion beauty in the unusual. The visual style of this series takes cues from Renaissance’s ‘Dutch Masters’ — painters who were renowned for creating art that evoked emotions with story and colour.